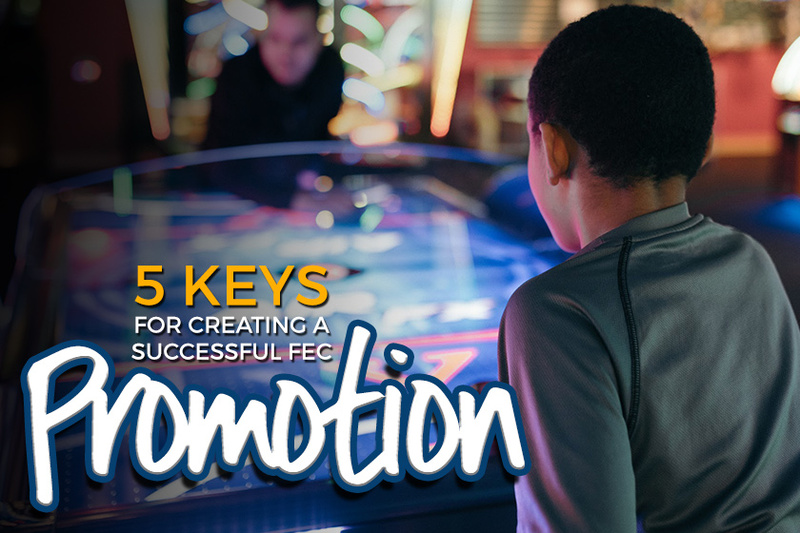 You know promotions are great for business, but what makes an FEC promotion work? Here are five essential elements of a successful promotion, and how you can use them to bring new and existing customers (back) to your venue. In order to understand the best target audience for your promotion, you first need to understand more about your customers. Conduct surveys, take some extra time to get to know your visitors personally, and look at your competitors (especially the ones who share the same target audience as your business). Try to get as much feedback as you can from current customers to make sure you are meeting their needs and creating offers that they truly find appealing. Once you have this down, you will be able to target them effectively. #02 – TAKE ADVANTAGE OF YOUR CARD SYSTEM’S TOOLS. Many business owners and operators are overlooking some of the very valuable features of their card system that can be used to easily set up and monitor creative promotions. Take some time to explore its capabilities, such as bounce back offers, guarantees of fun or timed game play. Visibility is key, so make sure to let your customers and prospective customers know about your exclusive deals. These days, it’s not enough to put a flyer up or take out an ad in a local newspaper and hope that customers will come in droves to your FEC. Social Media including Facebook, Twitter, Instagram and Snapchat can be incredibly strong tools to promote your specials. Here is a great article on how to use Facebook to amplify your FEC promotions. Another way to reach your customers (and future customers) is via email marketing. Use the functions built into your card system to gather email addresses from your guests. Don’t forget to promote your email newsletter on social media to keep your subscriber list growing! From spring break to the winter holidays, there are plenty of opportunities to use seasonality in marketing your FEC. You may want to offer more discounts during the down season to attract more customers during a traditionally slow time, or you might want to implement a promotion during the busy season to raise awareness about your business and bring in even more customers. The key to capitalizing on seasonal trends, festivities and holidays is building them into your marketing strategy ahead of time. Create a marketing calendar so you can make sure you don’t miss any chances to boost your sales. Have a promotion around a nearby bigger event like a local sporting event, concert, or festival. This helps drive business and generates awareness of your FEC to a much larger audience who attends this larger event. Examples of this include offering $5 bonus to people who have a ticket to a local (sport?) game, or half price games before/after a concert that is down the street. Create a promotion that gets people in on slow weekday nights, or create an offer that starts at 4pm and ends by 5pm (or whatever your off-peak hours are). A classic example is “Play an entire hour of unlimited games for just $10! (valid from 4-5pm Tuesdays and Thursdays)” This can get people in right before or after they would normally come to your venue. Almost every month, there’s a major opportunity for you to connect with your customers. Father’s Day, 4th of July/Independence Day, Halloween, Thanksgiving, Christmas, are just a few of the dozens of daily, weekly, and monthly celebrations you could use to offer a special promotion to help your FEC stand out. Identify a holiday that you love and work around it. You could include a Halloween costume contest where top costumes get a free VIP card, or even a different offering for each of the twelve days of Christmas (see a great example here).The promotion not only gets business, but also will have your customers sharing and tagging you in the pictures they post on their social media channels. This idea is all about having promotions to get people to try a new game you have just brought in or to visit a new location that has just been opened. New games can be a big investment, so why not give them a kick start to help start earning revenue faster? Celebrating the anniversary of your business with a special promo is also a good way to gain recognition and show appreciation for your customers. For example, for your five-year anniversary, you can accentuate the number “5” in your promotions. You may have special pricing by offering $5 off with any purchase over X amount. You could also give away five Gift Card or VIP memberships every day during the week/month of your anniversary. Use your sales reports to determine the effects of the promotion on your business. Look at goals you set for the promotion. Did you achieve them? The main goals of your promotion should be to boost sales and increase brand awareness. Learn from your mistakes and take note of what you did well, and next time, your promotions will be guaranteed to be even more successful.